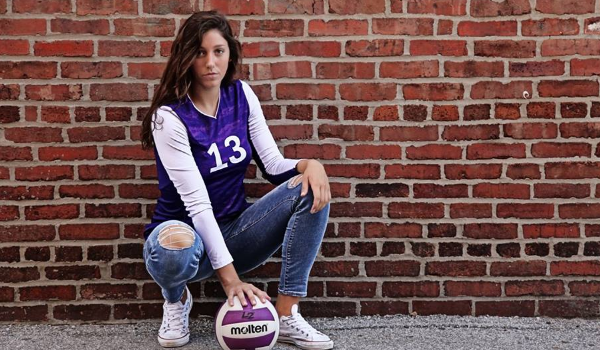 When it comes to the topic of who would be the best multiple sport senior athlete in the entire state of Kansas, a name that comes up in conversation would be Pittsburg senior athlete Taylor Muff. Muff, a three-sport star for the Purple Dragons, excels at every sport that she plays. In volleyball, the 5-foot-11, outside hitter, is an all-state selection and has signed to play next season with Division I Northern Colorado. In basketball, she was a second team All-5A pick by Sports in Kansas in 2016 and is a multiple time state champion in track and field. Muff can become busy at times with all of her sports but doesn't seem to have any problem balancing these sports over the school year. "The only time it can get crazy with balance is during the winter when I am playing basketball and club volleyball. Every other season has their own period and it usually doesn't overlap. I feel like being a multiple sport athlete helps me in training for all of the sports I play. My favorite is volleyball because of the skill aspect and it takes a lot of thinking." Muff said. Although she is headed to play volleyball in college and it's her favorite sport, track and field may be Muff's best sport at the high school level with four individual state titles in the hurdles(100H x2, 300H x2). Muff is also a rare thrower/hurdler combo, as she took second in the 5A discus last fall and had a season best of 144'3". Her career best in the hurdles are 14.8 in the 100H and 44.5 in the 300 H. She also runs the 4x400 relay, which took second in 5A last season and features a 58 split in the 400. "Usually you don't see a hurdler throwing the discus. I get some weird looks from the officials when I ask them to put me in the first flight to throw because I needed to go run hurdles." Muff said. Muff hasn't always lived in Pittsburg, she grew up in Concordia until she moved to Pittsburg in the summer of 2010. Muffs father, Kevin, a Salina native who played basketball at Kansas State, took the head men's basketball job at Pitt State in April of 2010, after serving several years as the head coach at Cloud County Community College in Concordia. What Pittsburg didn't know is they had two division one athletes coming to town six years ago in Muff's older sister, Skylar, who went on to play volleyball at UMKC, after graduating from PHS in 2012, and obviously Taylor who is headed to division one next fall. Oldest sister, Alex, a Concordia High School 2009 grad, was a four-year letterwinner at Kansas State in volleyball and played one year of basketball after KSU graduation under head coach Lane Lord at Pittsburg State.It's safe to say, the Muff's are an athletic family. "Concordia was a really small town so I wasn't sure what to expect when we moved. Thankfully, we were welcomed with open arms to an incredible school and university that made us feel at home." Muff said. Right now Muff is focused in on volleyball and the Dragons punched their ticket to the 5A state tournament last week with a sub-state title, the first one for PHS in 13 years. "It was one of the best feelings to be able to bring that plaque home. We were expecting it and we wanted it more than everything. Seeing all the pay off for the whole team was really amazing." Muff said. Pittsburg (35-5) is the three seed and will play in Pool II at the 5A state volleyball tournament starting this Friday in Topeka at the Kansas Expocentre. Also in Pool II with PHS: 2. Goddard-Eisenhower (36-5), 7. St. Thomas Aquinas (31-10), and 6. Emporia (28-8). Pool I of the tournament includes: 1. Newton (38-4) 8. St. James Academy (23-15), 4. Lansing (33-5), 5. Shawnee Heights (33-6). Pittsburg's first match will be Friday at 4:30 p.m. against Emporia. Pool and Bracket play here. We caught out with the outstanding senior athlete below in the latest Q&A edition of Faces in Kansas. My entire life I've been surrounded by sports and my parents always encouraged me to try everything and I just really fell in love. What is it like to be the daughter of a coach and in a family of people so involved with sports? Since he obviously knows a lot about basketball, I'm always being pushed and coached by him to be the best player that I can. My sisters both played collegiate volleyball so whenever they come to games I'll always get pointers on the side. Being a part of that can sometimes be frustrating but it's really an advantage to be surrounded by people with so much knowledge about sports. Best volleyball player and best athlete between you and your sisters? What is it like to play at Pittsburg High? I can't imagine being anywhere else but here. I've had so much success here thanks to my coaches and my teammates and the atmosphere of our school at games or student events is incredible because you can tell that everyone has pride in their school. How awesome was it to punch your ticket to state volleyball for the first time in 13 years, was this expected coming into the season? It was truly one of the best feelings to be able to bring that plaque home. We were expecting it. We wanted it more than anything because we knew that it was attainable so we worked and worked until we got there. Seeing that pay off for the whole team was really amazing. Although you didn't grow up in Pittsburg what was the move like coming from a small town in Concordia? Since Concordia was a really small town, I wasn't sure what to expect when we moved. Thankfully, we were welcomed with open arms to an incredible school and university that made us feel right at home. What is it like to be a multiple sport athlete and balancing all those, what is your favorite sport? Really the only time I struggle with balancing sports is during the winter when I'm playing basketball and club volleyball at the same time. Every other season has their own designated time period that usually doesn't overlap. I think being a multiple sport athlete helps me to excel in all of my sports I play because every one of my sports will help me train for another advantage in my other sports. For example, running up and down the court in basketball gets me in great shape for track. My favorite sport is volleyball just because of the skill aspect of it and it takes a lot of thinking. What makes you such a special athlete in track and field, its pretty rare to be a thrower and an elite hurdler in the state isn't it? Usually you don't see a hurdler throwing discus. I get a lot of funny looks from the throwing officials when I ask them to be moved to the first flight because I needed to go run hurdles. Key players on your volleyball team this year? Our libero, Kayla Clark has been an impacting player on our team this year. She's always the one that has our backs on every ball and loves to get after it on the court. Abbie Casper, our setter (and one of my best friends) is the leader of our team. She'll always the most aggressive player on either side of the court and she makes some really big plays for us. We can always count on her to push us towards a win. Another player, Kaitlyn Kidd, our middle has improved tremendously this year. Every practice she goes 100% and expects us (her teammates) to do the same. She's always the one on the ground for a ball (which is unheard of for middles) and always plays to the whistle. What is it like to play for all your high school coaches? Megan Mantooth, my volleyball coach, does a great job motivating us to be better everyday. The big thing this year was to embrace every day because it's another day that you get to play volleyball. Many people don't get the chance to do something that they love everyday, so when you're able to, you should make the most of it. She's also always lifting us up and telling us how proud she is to be our coach and we all can't help but feel the same. My basketball coach, Eric Flaton, he's pretty cool. He's very personal and has a special relationship with each and every one of his players. He doesn't mind getting in your face and yelling at you to step it up and make that shot which I really love about him. He's intense and somewhat scary at times but we all know that he just wants to make us better and that he really cares bout all of us. Gary Ausemus, my track coach, is who I like to call "The Man". He knows everything about anything (he's a math teacher too, duh) and knows hard work when he sees it. If he doesn't see it, he calls you out on it. Ausemus encourages everyone to be diverse because he knows that people will succeed when they try new things. Guess who was the one that encouraged me to do discus? All in all, every single one of my coaches loves to see success and will do anything for you to help you and the team to get there. Why did you choose Northern Colorado, what was so special in choosing it? UNC has a great volleyball program. They've had a lot of success with head coach Lyndsey Oates. Coach Oates was the person that really made my decision clear. She told me everything that I wanted to hear and showed me that she actually wanted me at the school and on the team. She made me feel welcome and didn't push me into anything. She let me extend my deadline to come out for another visit which was actually the visit I committed at, After that day, I just knew that that's where I wanted to be. My ideal future would be to backpack through Europe and Asia to experience all the different cultures and people. Best place to eat in Pittsburg?